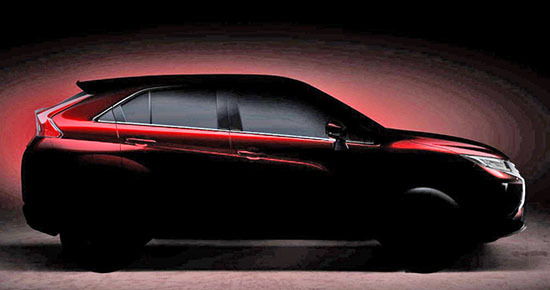 Burlappcar: All new Mitsubishi SUV coming out. I would call this the new Outlander Sport. Except now, there are rumors this is actually a bit larger. And will fir in between the Outlander and the Sport. So I really think this is actually the new Sport Mitsubishi desperately needs. We can't tell much from this official teaser. but we have already seen concepts versions. And plenty of the toned down prototypes of the production model around. So there might not be much of a surprise. I think they need to do something really original to come back from Zombie Land. Like only have a plug-in version. Or just EV. Let's get ready for a letdown!!! Although, it's hard to be disappointed if your expectations are already lower than dinosaur bones..
Is Mitsubishi even relevant in this market to post photos and rant about it in this blog? Just wondering. As Blog writer, I do specialize in irrelevant subjects and pictures. So, to answer your pertinent question, I would say yes, this photo, as well as the rant associated with it, are perfect for this site. Rumor has it the only revolutionary thing about this vehicle will be bringing back the Eclipse name.. though in this market they may want to add a "d" at the end. Yes, I've heard about using the Eclipse name. Then should we call it Nissan?